From the moment our baby teeth start growing in, our dental hygiene journey begins. Our parents begin the task of trying to keep our oral health up. But, once we’re a little older, they start teaching us how to brush our teeth. They might not have taught us about electric toothbrushes, but we’ve known about the importance of this task for many years. Keep your teeth clean and healthy is part of being healthy overall. So that’s why our parents start lightly brushing our baby teeth once they start coming out. If we start that habit early and continue on into adulthood, it will be better for us in the long run. Dental hygiene starts while we are still in our mothers’ bellies. You may have heard the saying that a pregnant woman “eats for two.” And that’s more or less true. Anything the mother-to-be consumes will likely have an effect on the growing child. However, once the baby is born, the parents have to teach the child how to have good dental hygiene. Part of taking care of your tooth involves the tools you use. Although there are still traditionalists who prefer the manual toothbrush, more people are moving toward the electric toothbrush route. We have put together a list of the best electric toothbrushes, so you can find the best tools for the important job of keeping your mouth healthy. Oral-B has been a longtime standout brand in the dental hygiene industry. Around since the 1950s, this oral care brand clearly knows what it’s doing. So it is no surprise that the best overall electric toothbrush is one from the brand’s line. 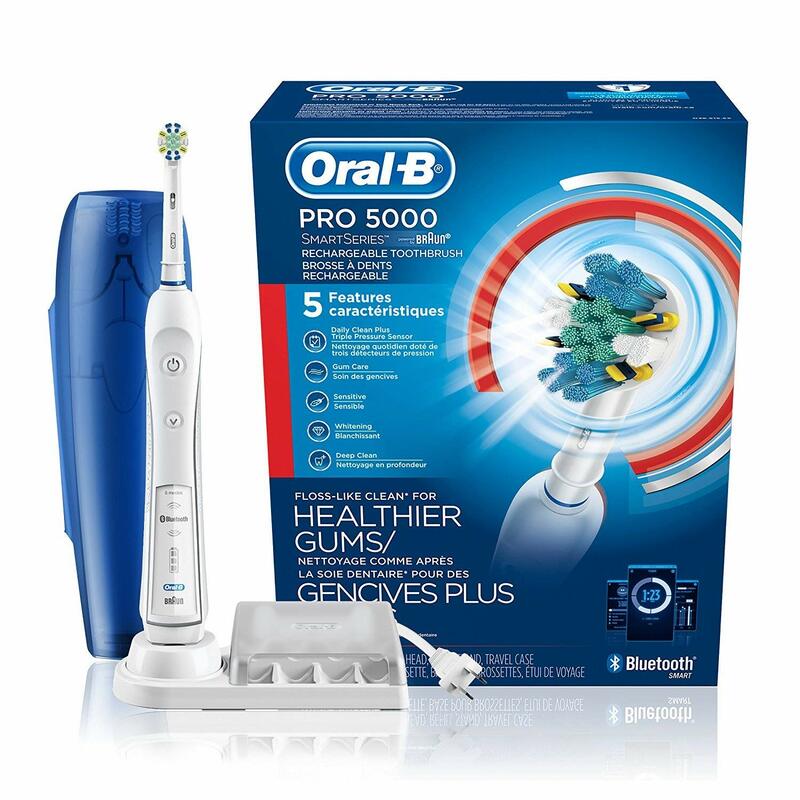 The Oral-B Pro 5000 SmartSeries is by far the best general electric toothbrush. Although there are a lot of other models in the SmartSeries, this particular model took the top prize because it was the most budget-friendly without losing many features. First of all, this toothbrush has Bluetooth technology and links the actual toothbrush to an app on your smartphone. The Oral-B app has a timer that tells you when you’ve brushed your teeth for the necessary two minutes. However, you can customize the app for a longer time if you’d like. The timer will also let you know when to move to another part of your mouth after 30 seconds and tell if you’re applying too much pressure. During the brushing session, you will also be able to catch up on news, weather updates and calendar listings through the content section that’s located underneath your timer. At the end of your brushing session, you will get a report of how you did during the cleaning session. While all the forward-thinking technology is awesome, one of the downfalls is the fact that the Oral-B Pro 5000 SmartSeries does rely too much on the mobile app. So if this toothbrush didn’t have the Bluetooth technology and the app, then the Oral-B Pro 5000 SmartSeries will seem like any other electric toothbrush. If that were the case, then the $90 to $159 price tag would seem too steep. Another downside to the Oral-B Pro 5000 SmartSeries is the fact that it’s not the quietest of toothbrushes. Because it’s powerful, you will likely hear the motor running. If you’re sensitive to that, then perhaps you should choose a different model. Finally, there’s the fact that the timer is only located on the app. It would have been nice if you could find the timer on the toothbrush handle itself. However, in spite of its flaws, this is clearly one of the best electric toothbrushes available. Electric toothbrushes are becoming more popular. However, they are still very expensive for many people. Claire Burke and Ben Goldberg were two of these people. But the difference was that they wanted to change that idea. 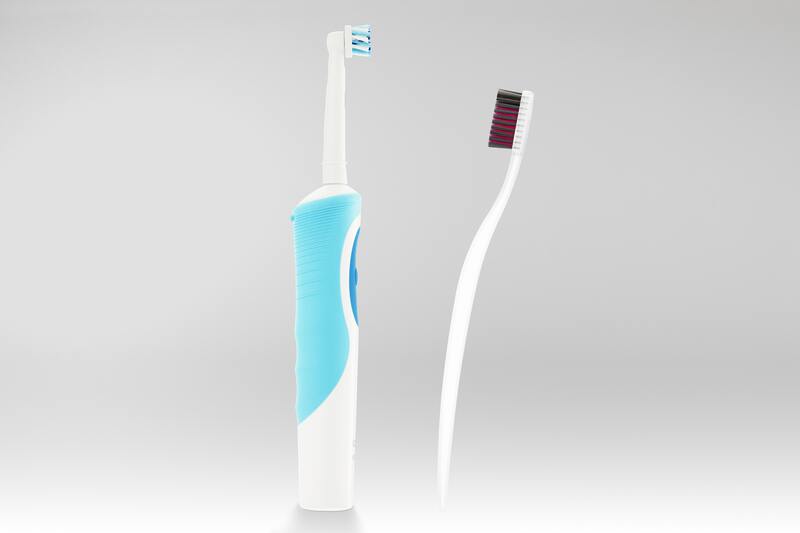 And the Goby electric toothbrush was born. With a handle that’s comfortable and ergonomic, the brush has a round brush head. Unlike other budget-friendly models this one has an oscillating brush. This type of motion will be able to brush over more surface area on the tooth. And unlike other brushes on the cheaper end, you will be able to adjust the cleaning setting. This one has two — standard and sensitive. While some may say that both brush speeds are still very robust, you will feel a difference between the two settings. However, if you do have sensitive teeth or gums, this might be a bit too much for you. Each brush kit prices at $50 if you opt into the $6 brush head replacement subscription, which you can receive every one, two or three months. If not, you can just buy the brush with an include brush head for $65. There is a variety of color combinations, and the company always adds special edition ones throughout the year. 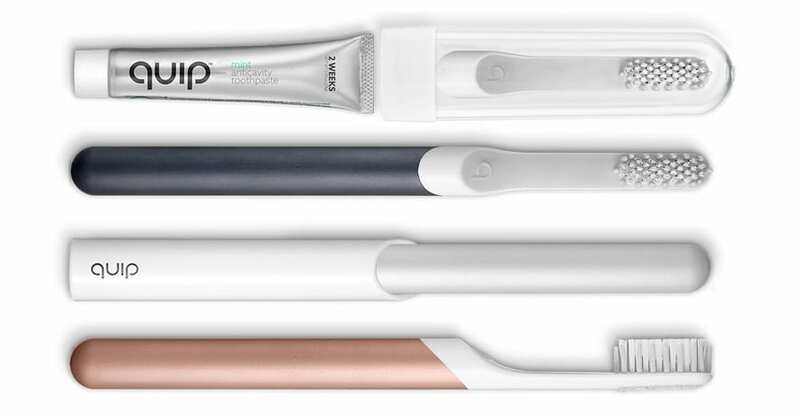 If there’s one electric toothbrush that has been recently dominating the market, it’s the Quip. One part metal and one part plastic, this electric toothbrush is very simple in design. But for some, that design is what it’s all about. The Quip was developed by a dentist in New York City who noticed that there were all these tools that were meant to help people have healthier teeth. However, this dentist noticed that the tools might be new, but everyone’s habits stayed the same. So with the help of the Quip, the goal is meant to change people’s view and practices when it comes to oral health. Since the Quip has a very simple design and not many features, this model is meant for the person who is looking for a straightforward electric toothbrush. 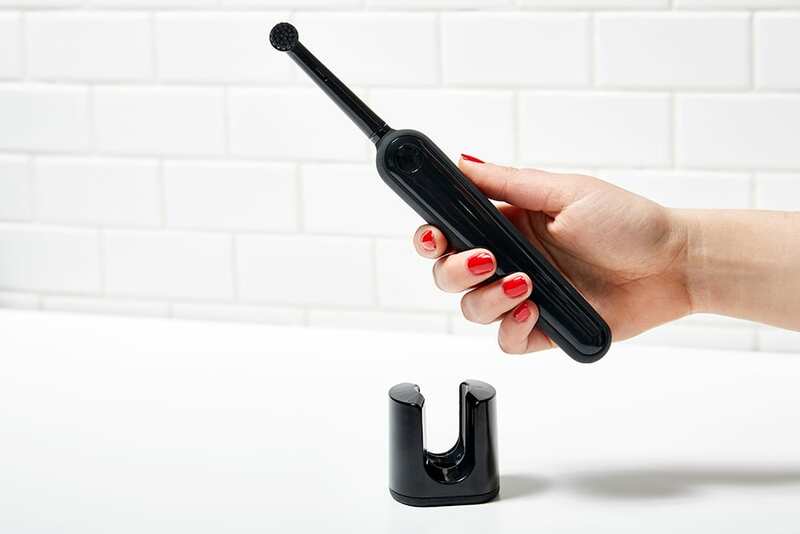 Similar to the size of a manual toothbrush, the Quip is portable and travel-friendly. You can toss it into a big suitcase or a tiny purse. One major feature that the Quip has that other brands don’t have is a subscription service. According to the American Dental Association, a toothbrush or brush head need to be replaced every three to four months. While we’re sure that many people tend to overlook this rule, Quip’s subscription service is meant to remedy that problem. Once you buy one of their toothbrushes, you can sign up for a subscription for as low as $5 to receive a new brush head every three months. You can use the same subscription service for toothpaste, too. Despite all these conveniences, there are some cons for the Quip electric toothbrush. Because it’s such a simplified electric toothbrush, that means it’s not that powerful. Sure, it can do the job. But next to some other brush models, it may not stack up. Finally, even though the toothbrush only costs you $45, the dollars start to add up with the subscription. Sure, the refills are only $5 for every three months. However, if something broke, then you would need to get a replacement sooner than expected. And at some point, the total price starts to increase over the course of a year. However, this is one of the best electric toothbrushes for people who don’t want to have to think about replacing their heads themselves. Plus, the design is gorgeous. 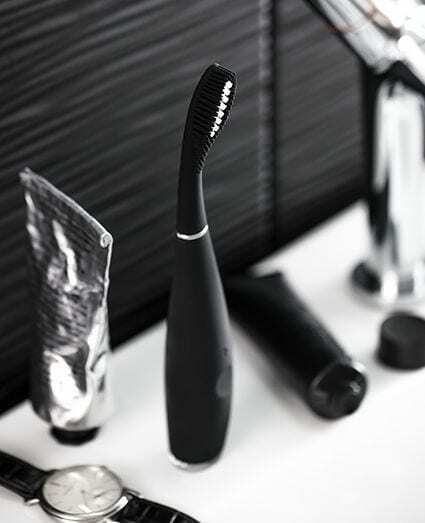 When you first check out the Foreo Issa 2, a toothbrush might be the last thing that comes to mind. But yes, it is an electric toothbrush. Now that we have that out of the way, this electric toothbrush isn’t for the typical user. It’s definitely meant for people who like things that are a little modern, super funky and just go in a different direction in terms of design. However, as far as dental care tools go, this one is a pretty solid model. First of all, it’s completely covered in silicone, which makes it completely waterproof and less likely to have bacteria grow on it. Then there’s the bristles. There are two types of bristles. The silicone ones are meant to massage the gums while the PBT polymer ones will handle the food particles stuck in between your teeth. Then toss in the sonic technology, and you’ve got a pretty powerful electric toothbrush. Foreo, the brand that’s also known for the popular spa skin massager called Luna, also boasts that one charge will bring 365 days of usage without having to plug it in again. As progressive as this electric toothbrush, there are some not-so-great aspects to the Foreo Issa 2. First of all, one major complaint is the price. Retailing at $169, this electric toothbrush is on the higher end of the electric toothbrush range. Another issue that arises is the fact that the brush head, which is mostly silicone, can be too bulky for people with smaller mouths. So it would be more difficult for you to get into the back parts of your molars with this kind of brush. Then there’s the fact since there’s nothing but a “+” and “-” sign to signify moving from one setting to another, you’re not sure what end of the 16-point settings you’re using. However, if you really love this modern design or just want something that looks nice and does a fairly good job at cleaning your teeth, then the Foreo Issa 2 could be the right electric toothbrush for you. There’s an old saying that goes, “Two heads are better than one.” But what about three? The Triple Bristle Go Travel Sonic toothbrush has three bristles, which might turn people off pretty quickly. However, there’s some logic to this. Designed by a dentist, this electric toothbrush is meant to brush all the sides of each tooth simultaneously. So that means less work for you. With the Go Travel Sonic version of Triple Bristle toothbrush, you will be able to take it anywhere you go. It also has no charging station or cords, which make it less bulky on the packing end. The brush itself runs on two AA batteries. And if you want to be a little more eco-friendly, you can pick up some rechargeable AA batteries. Despite the ease and portability of this electric toothbrush, the Triple Bristle Go Travel Sonic toothbrush has some issues. First, you can’t control brush pressure. So you may want to make sure you’re not pressing the brush too hard on your teeth. Then there’s the fact that it runs on AA batteries. While they can do the job on most small devices, AA batteries still aren’t as powerful as the rechargeable lithium ion ones. So that might not be something you’ll want to deal with. Then of course, there’s the three-in-on brush head. If your mouth is on the smaller side, it may take some time to be comfortable with this brush. Or you just may never feel comfortable with it. So if that’s your situation, the Triple Bristle Go Travel Sonic toothbrush may not be the right electric toothbrush for you. However, if you love that idea and you want to keep your mouth super clean, give this great electric toothbrush a try. 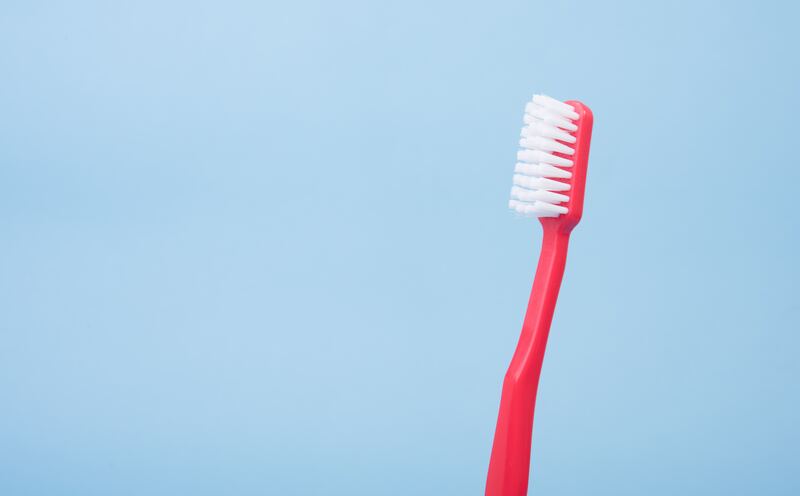 Now that you know about some of the best electric toothbrushes out there, learn more about why electric toothbrushes, proper brushing practices and how important caring about your dental health is to your overall well-being. The first evidence of a toothbrush dates back to China in the seventh century. While primitive in engineering, it did the job back then. Fast-forward to the 1700s, William Addis of England refined the idea while he was behind bars. He fashioned a handle out of bone, drilled some holes into it and inserted boar hairs into it. What we know as the toothbrush today was born. He and his family soon became the go-to for all things toothbrushing. But just like every invention, there’s always progress. The first version of the modern electric toothbrush came out in 1954. Now years later, there are many people all over the world who are replacing their manual ones for the best electric toothbrushes. So what are the benefits of using an electric toothbrush over an electric one? First, it takes away a lot of the effort from the act of brushing. It’s a great alternative for anyone with limited use of their hands and wrists or suffers from arthritis. Also, people may be more likely to brush their teeth for the proper amount of time (two minutes) because many electric toothbrushes that have timers built into the device. Electric toothbrushes also do a great job of cleaning teeth. Although everyone should still make sure they floss every day, electric toothbrushes can also help get stuck food out easily. Some models can perform 30,000 to 40,000 brush strokes a minute. Because of this, you don’t have to use as much effort with an electric toothbrush. Even though you have been brushing your teeth since you were a child, sometimes you need a refresher on the right way of doing it. Similarly, if you’re switching for a regular manual toothbrush to an electric toothbrush, you might need to know how to brush your teeth with the new tool. While your electric toothbrush may make the act of cleaning your teeth easier, there are a few things to keep in mind when using one. Let’s start with the basics. You need to make sure the toothbrush goes over each side of the teeth. You also must be careful not to press too hard on your teeth with the toothbrush. Because there are thousands of brushstrokes happening every minute, pressing too hard on your teeth can grind down the enamel of a tooth and make it susceptible to more issues. Sometimes there are electric toothbrushes that will alert you when the pressure is too hard. However if your electric toothbrush doesn’t do that, tread lightly. You can change the brush setting to a lower speed or intensity. Then that can cause less damage to your gums and the surfaces of your teeth. Yes, you will need to brush as close to the gum line as possible because that will get rid of any growing plaque as well as prevent gum disease. If you do have sensitive gums, work those areas slowly. The time you spend brushing is very important, too. Dentists always suggest that we brush for at least two minutes in a session. Unfortunately, most people only brush for 90 seconds or less. Some don’t realize how long they do it. but othersjust want to get it over it. So, don’t be like those people and rush the brushing. Do You Need to Clean Your Electric Toothbrush? Although they’re meant for cleaning your teeth, even the best electric toothbrushes still need to be cleaned. This will keep it from looking gross. It will also help increase the life of your electric toothbrush. 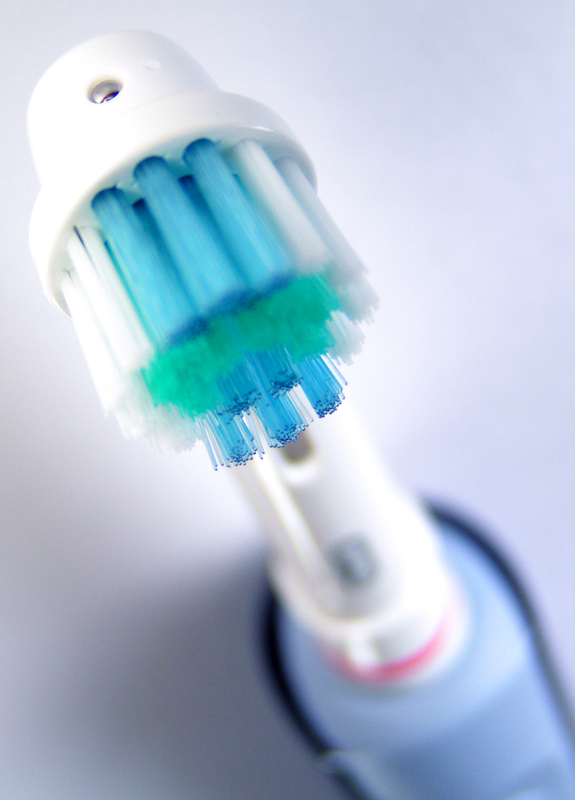 Wiping your electric toothbrush down after each cleaning session is a simple way to maintain the brush. You can use a wet towel or tissue to just wipe off any excess toothpaste that formed a film on it. If you don’t, the toothpaste film will eventually get into the device’s crevices. At some point, that grit will get to the mechanics inside. Over time, any kind of material that gets to the mechanics inside an electric toothbrush can corrode it and damage its inside. And that’s something you never want to happen. It’s also good to make sure you replace your brush heads every three months. You should also change the brush heads when the bristles are no longer standing up. That way, you won’t get into the problem of wearing out your electric toothbrush. By following these simple things, then your electric toothbrush, regardless of price tag, will be worth the investment. 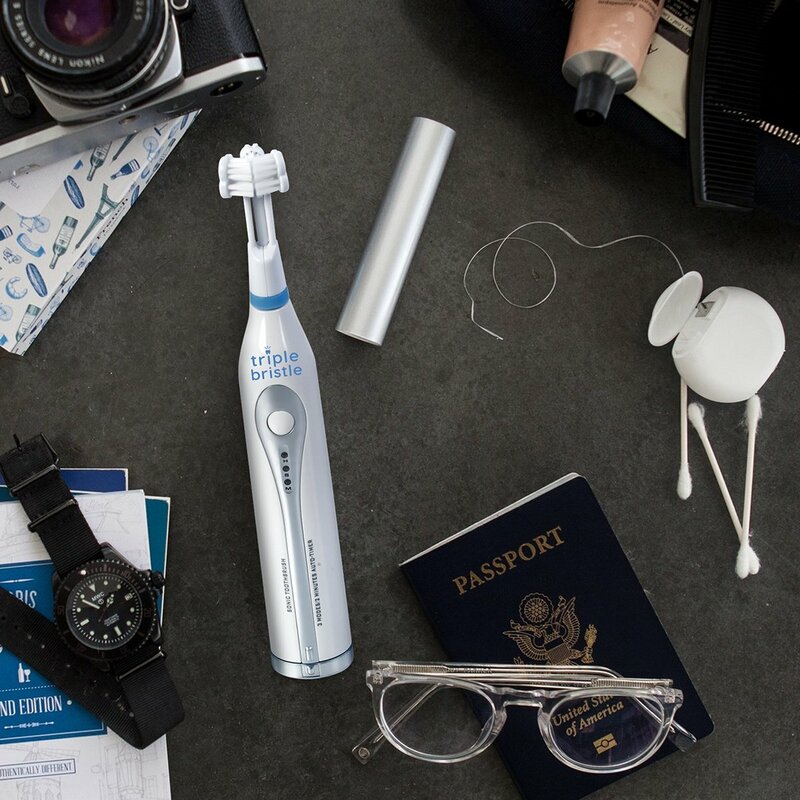 How Do You Travel With an Electric Toothbrush? Traveling with a manual toothbrush seems like a no brainer. You don’t need any charging docks or cords. There are no batteries that need to be juiced up or replaced. However, there are some people who are so accustomed to using an electric toothbrush that they can’t imagine going anywhere without one. Luckily for you, there are electric toothbrushes out there that work for anyone who is always on the move. Once you’ve picked up a good travel electric toothbrush, you should make sure to actually use it. Not only will your purchase be worth it, but it will also keep the mechanics inside to continue working. Layovers, delays or even running from gate to gate aren’t excuses for skipping a toothbrushing session. Since it only takes two minutes to effectively brush your teeth, you can pop into the public bathroom in your terminal or quickly hop into the plane’s lavatory to get the job done. We’re sure you can find a bathroom, and they’re also available on the plane. And if you aren’t shy, you can always just do it in front of everyone. Just make sure not to spit on anyone. 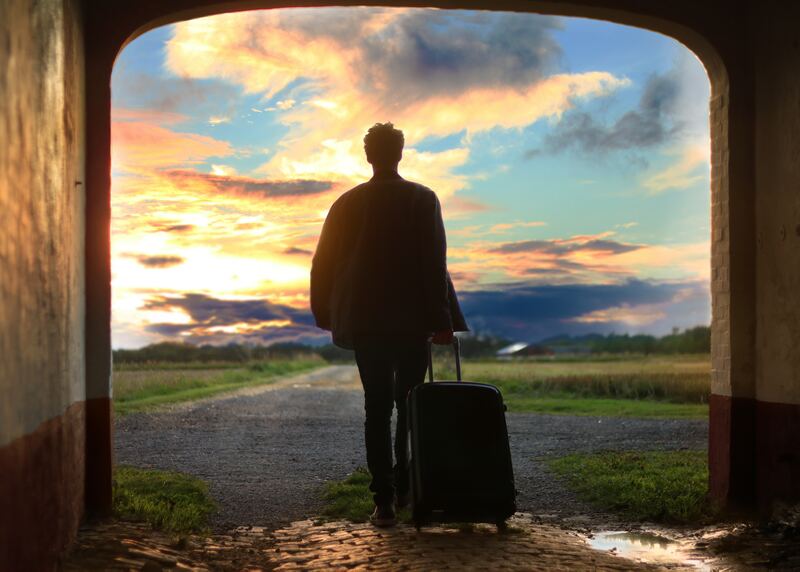 If you’re planning to travel for longer periods of time, then you should also consider getting travel insurance. Although there’s a small chance that something bad will happen, it’s always good to prepared. There are a number of countries don’t include tourists in its healthcare plans. So if something does happen, you don’t want to end up with a major doctor or hospital bill after. Research where the dental professionals are in the area you are visiting. By getting their contact information, you will be prepped for an emergency. Why Is It Important to Brush Your Teeth As You Age? At the beginning of this post, you learned about the importance of dental hygiene as children. But as you get older, it’s important to keep in mind the importance of keeping your teeth and gums healthy. Besides brushing your teeth twice a day and flossing daily, you also need to watch what you’re consuming in your diet. Acidic and sugary foods can affect the surfaces of your teeth. 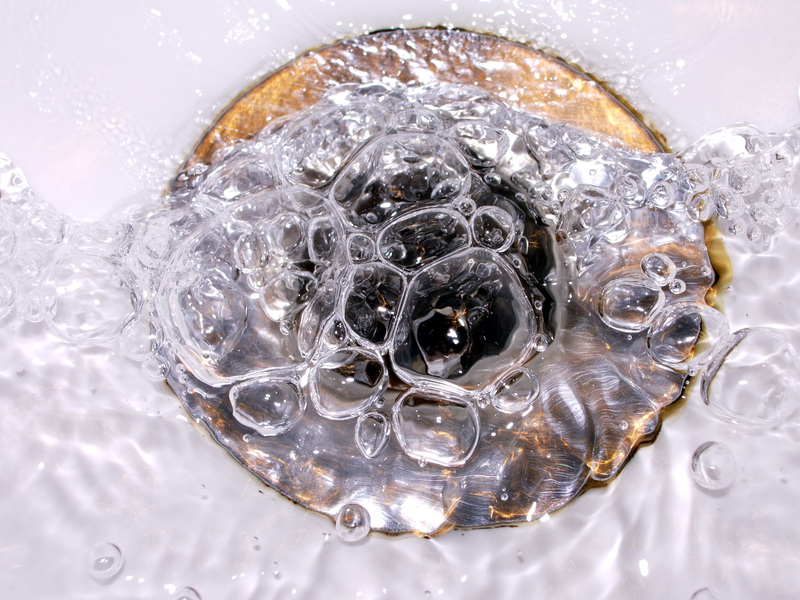 Pay a visit to your dentist every six months to a year, and remember that fluoride is your friend. While some people are perfectly happy with their manual toothbrush, the best electric toothbrushes can make your life a little easier and help you get your teeth cleaner. To find the best electric toothbrush for your needs, explore our in-depth toothbrush reviews.